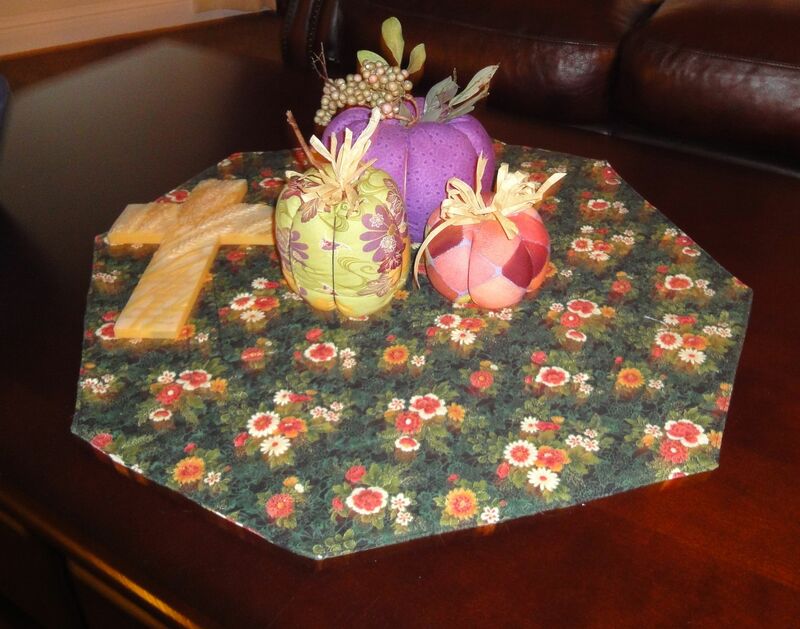 It’s a tried and true classic pattern, yes? 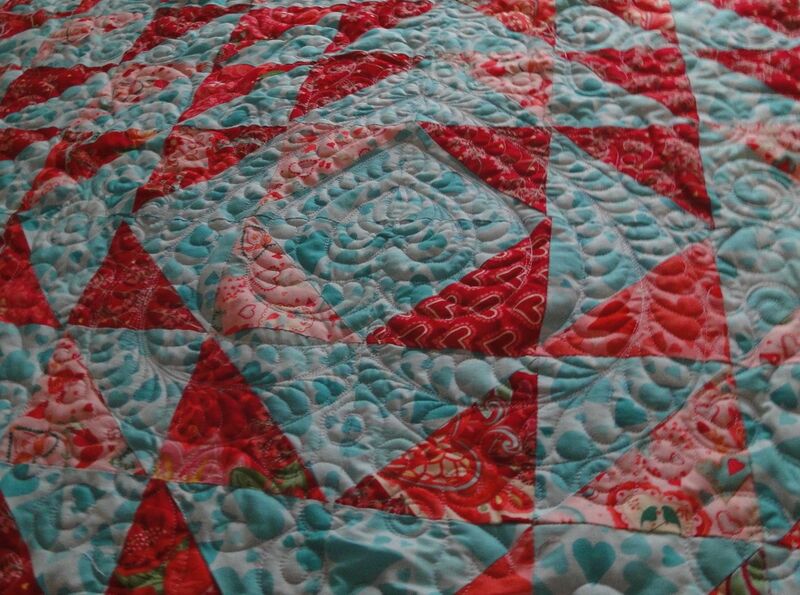 And a good pattern for a new quilter. 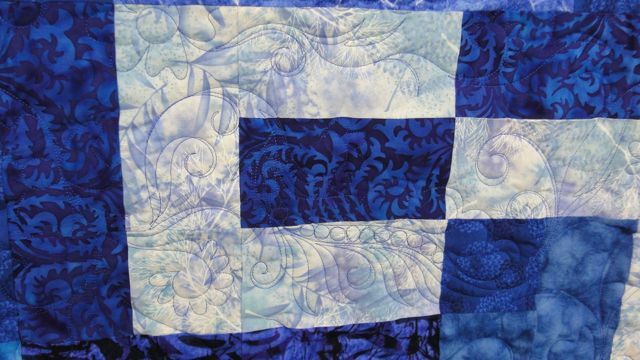 He likes blue, so he was working with blues. 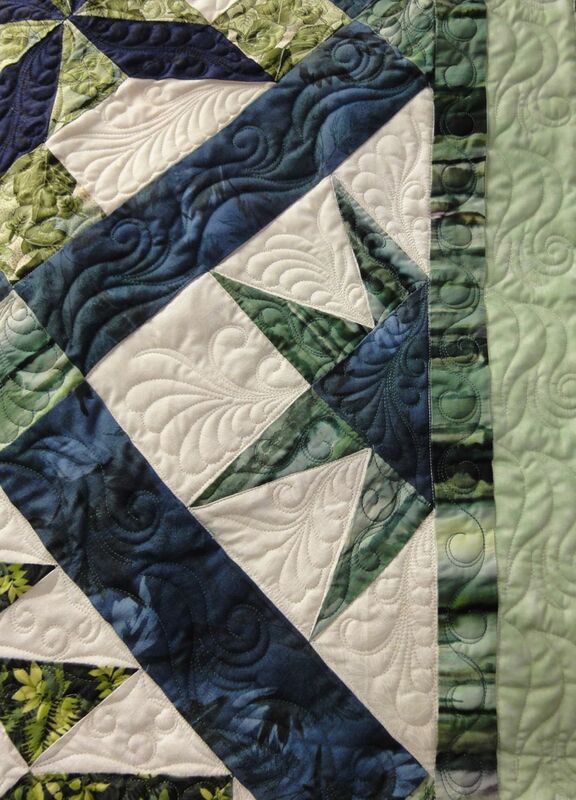 I had forgotten there is quite a bit of cutting initially And, since I’ve been sewing for over 50 years, it’s hard for me to remember that he hasn’t learned to read patterns…so it was slow going there. 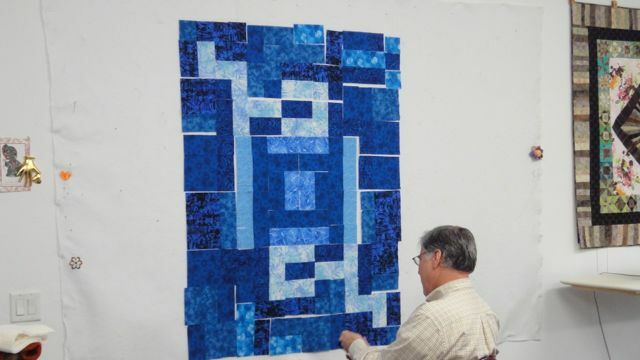 By the time he had all the pieces cut out, he wasn’t interested in constructing the blocks. So he just put the patches up and kept working on them. I was a little flustered at this point. 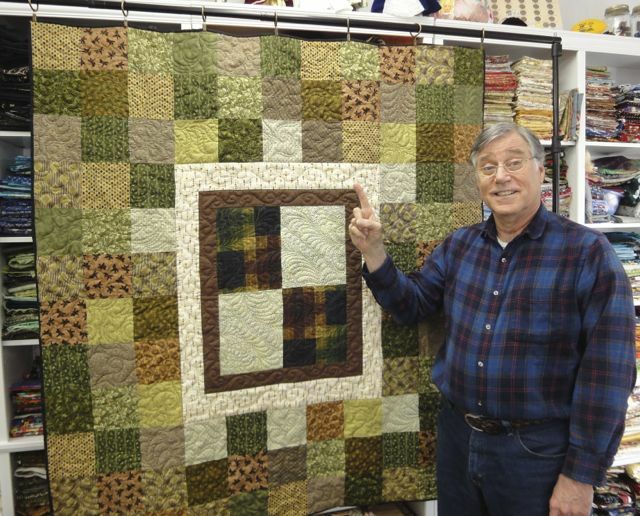 I really wanted him to get the idea of making a block, and using those blocks to construct a quilt. Er, umm…he was breaking the rules. Well I shouldn’t be surprised about that! 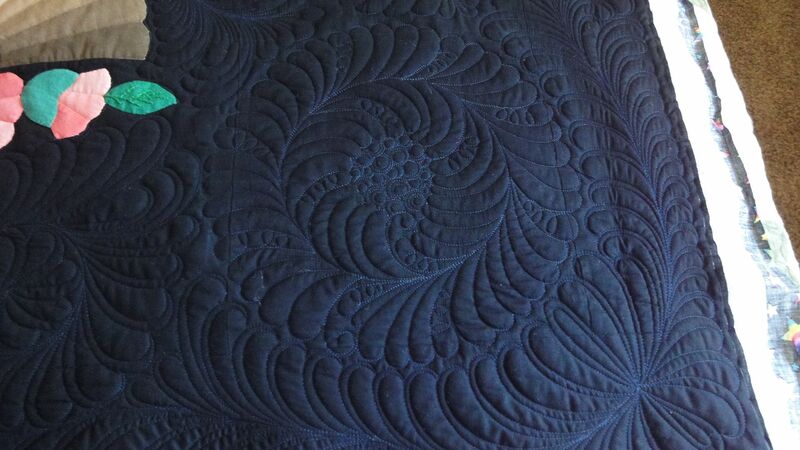 The back is a deep blue flannel we bought at Joy of Quilting in Florence, Oregon. Just right for this top. 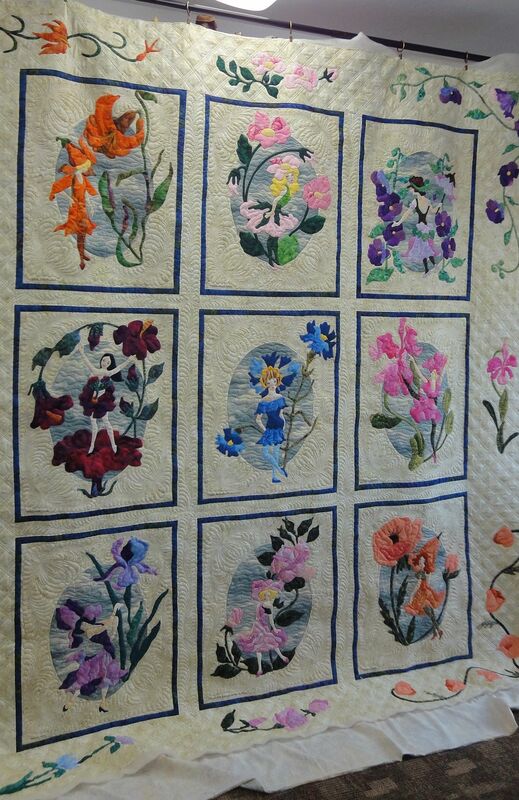 So there’s Quilt Number Two for John, another really pretty piece. I have been very busy this winter: John had been in the hospital for 18 days during December, and I worked very little during that time. 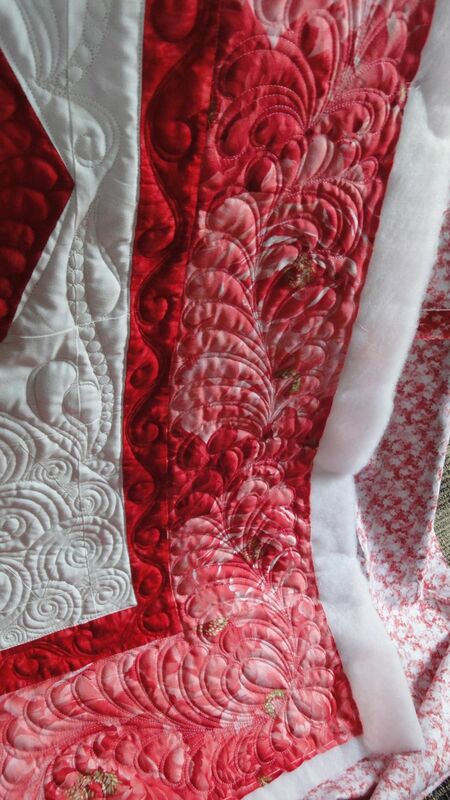 Just enough to meet Christmas deadlines for clients, and putting aside quilts that could wait. 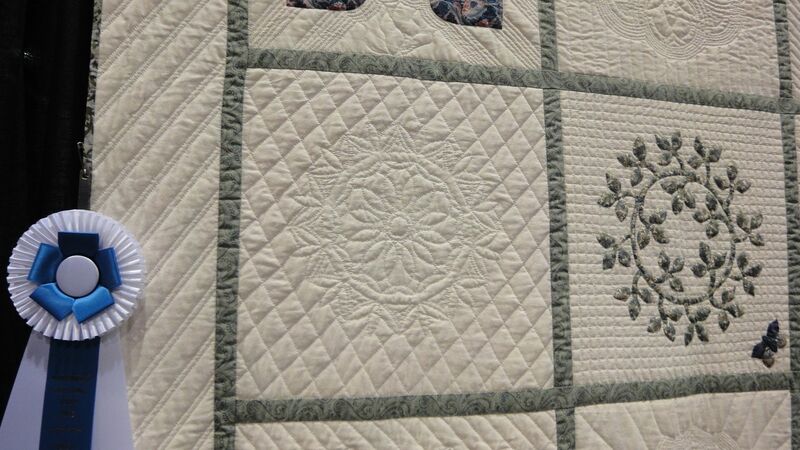 So I started the new year about four quilts behind, and soon zoomed to six quilts behind. January 1st my folks moved to Cottage Grove, and came to live with us until they can move into their home here. 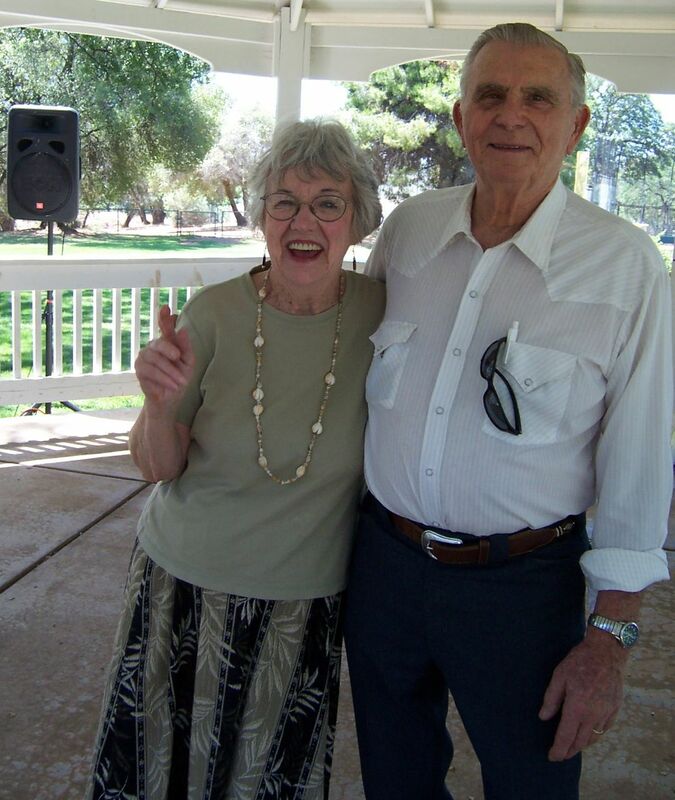 The move to their home here has been complicated: first it had to clear escrow. Then they wanted a little work done on it. 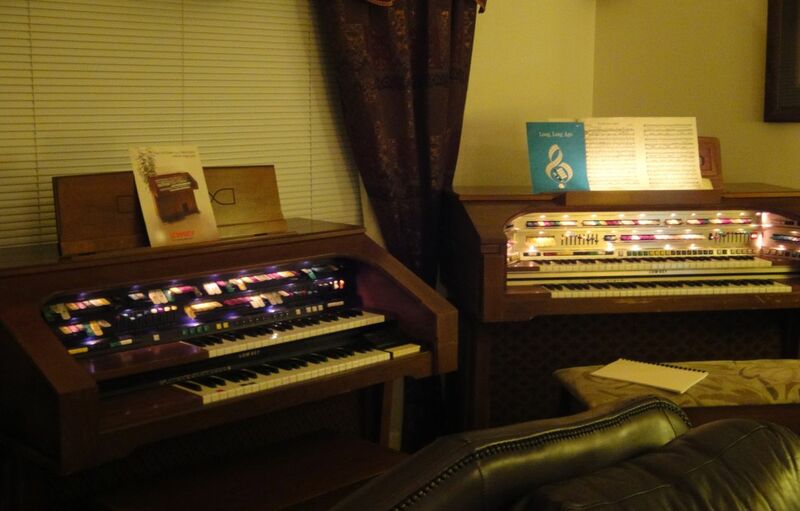 Then they found the entire foundation was rotten…so they’ve been delayed moving to their house, but we now have two Lowrey organs in our home. Mom & Dad love GoodWill. They visit nearly every day. It’s amazing the bargains you find there. In addition to collecting organs, teaching John to quilt, and working on my clients’ quilts, I’ve also been relearning to cook dinner for four every night! It’s been a very intense time. John and I also started going to the gym and working out…it’s been busy, but good. Very good. And just because you’re probably wondering, we’re all getting along very well. 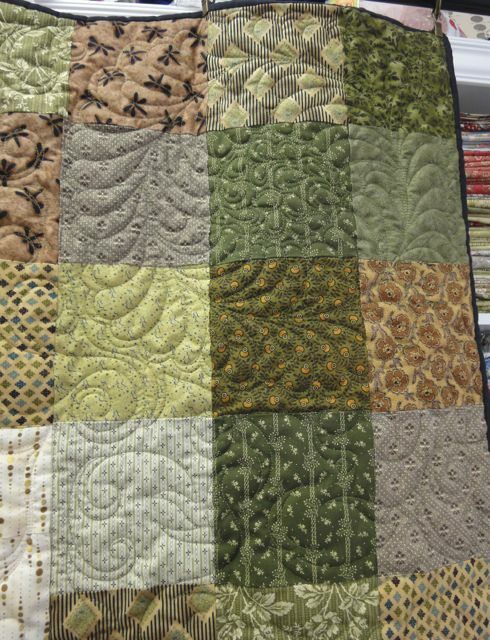 I was working at Quilter’s Junction in Junction City, Oregon, when they hosted this $5 Sampler quilt. 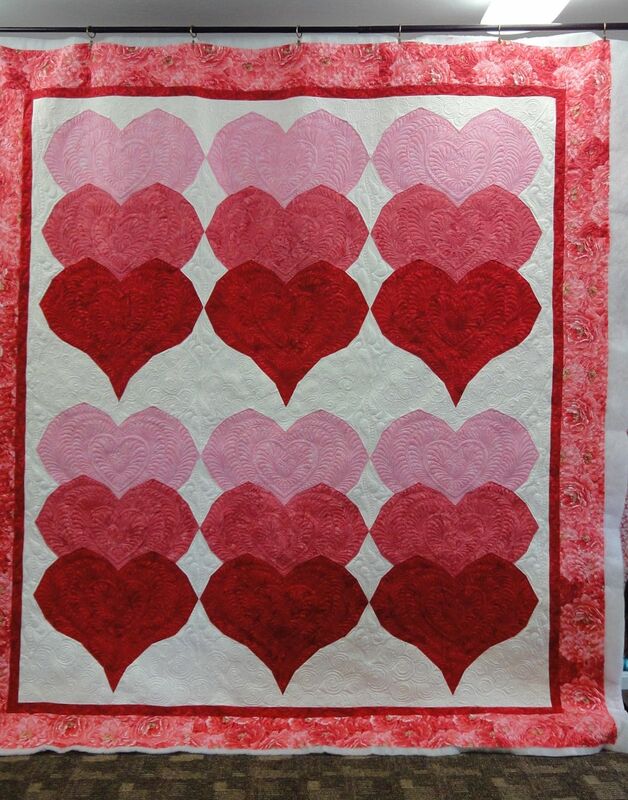 You began the quilt by paying $5 for the first block kit. The next month you brought your completed block to their meeting and were issued another block kit. 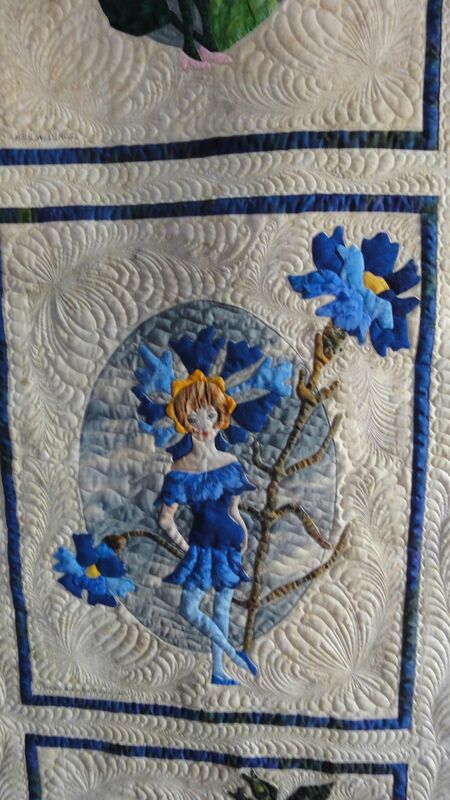 This is one of my favorite quilts, and I have one of my own from that time. These half stars are fantastic, aren’t they? 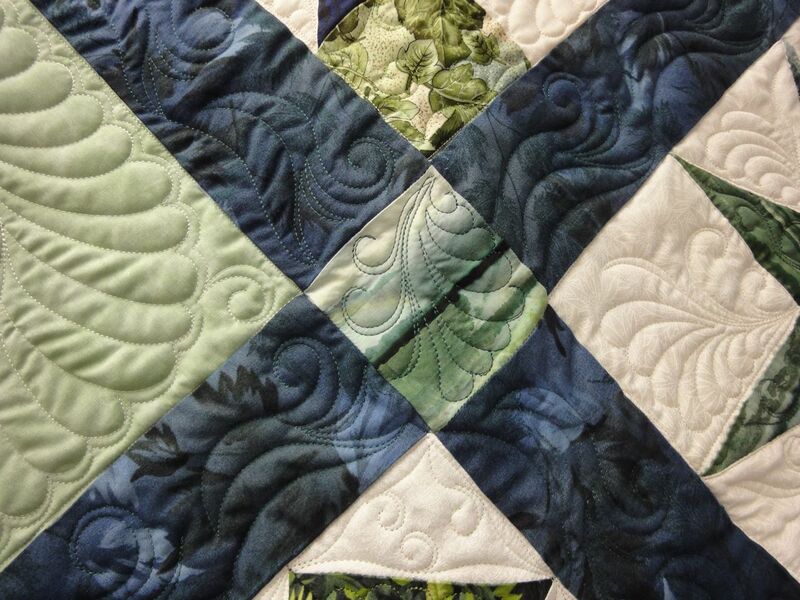 More feathers, more tendrils, lots more quilting! 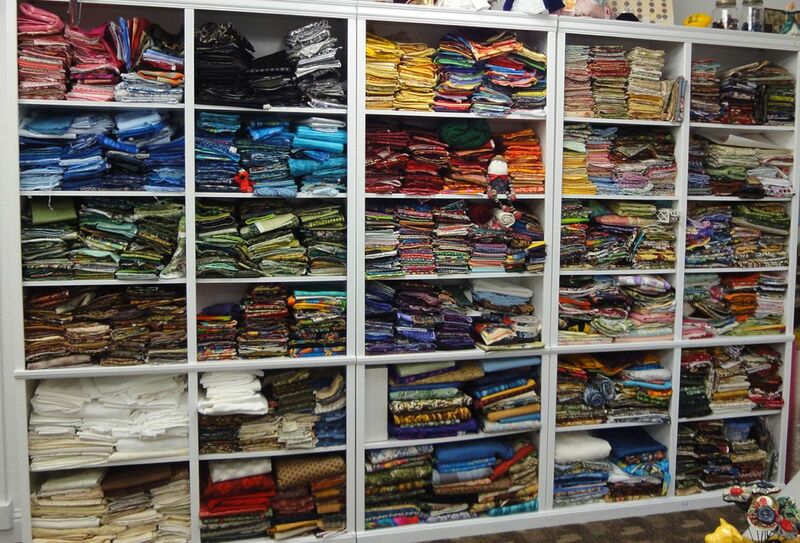 The really good news is I’m now only three quilts behind. 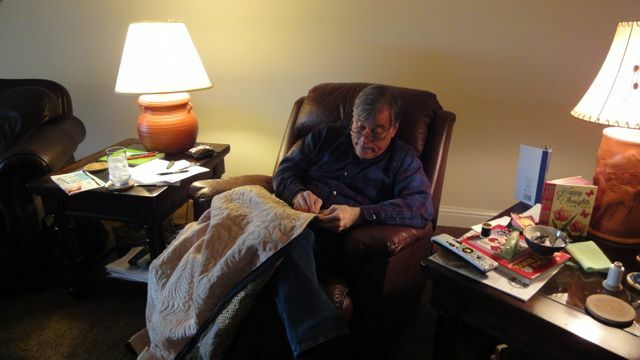 Sometime this past January I showed my husband John how to sew a seam. 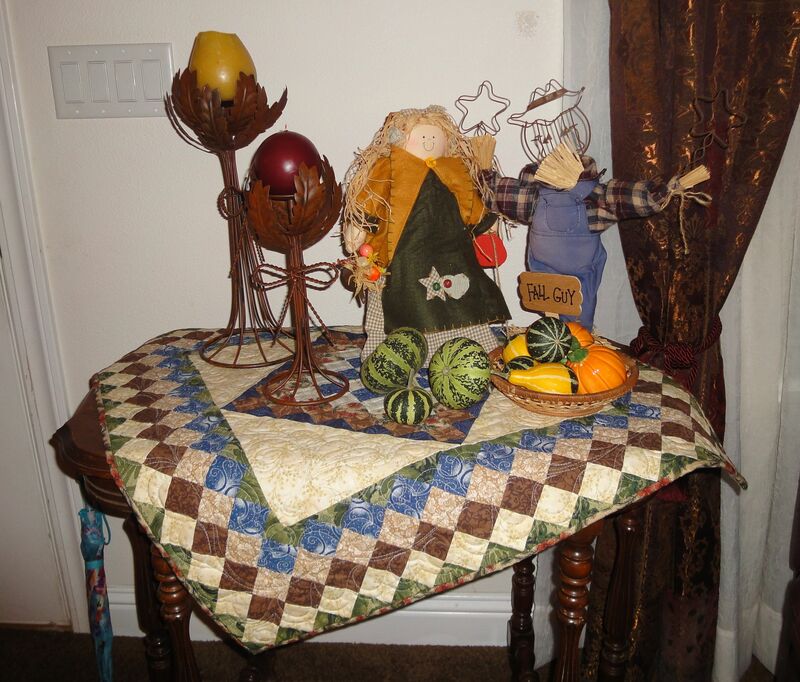 Then he sewed another. And another. 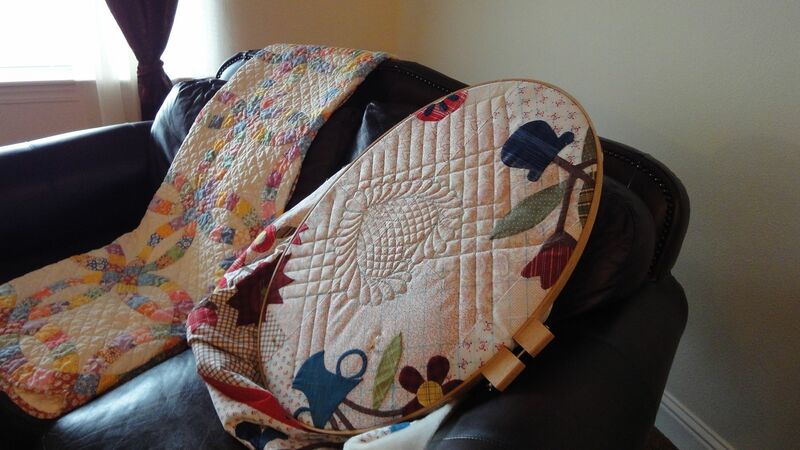 And then he had a quilt top made. 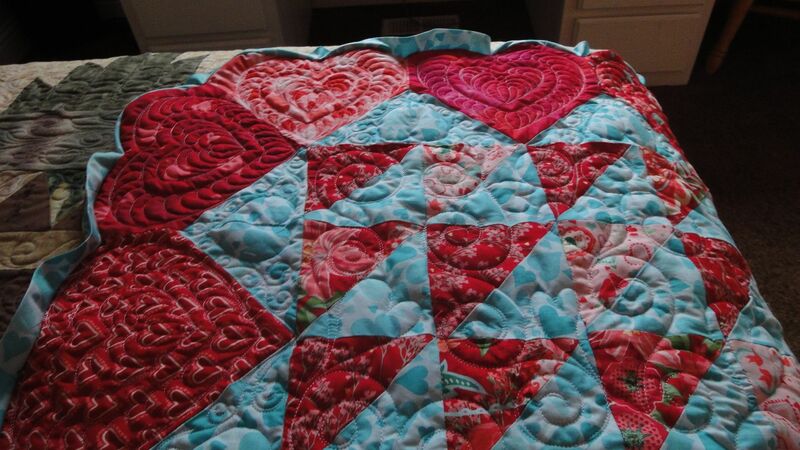 And then I quilted it for him. 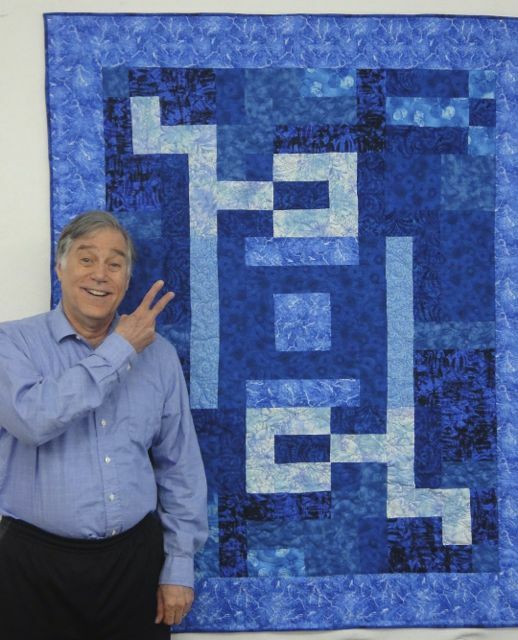 He gave this quilt to a young lady who is recovering from distress in her life. 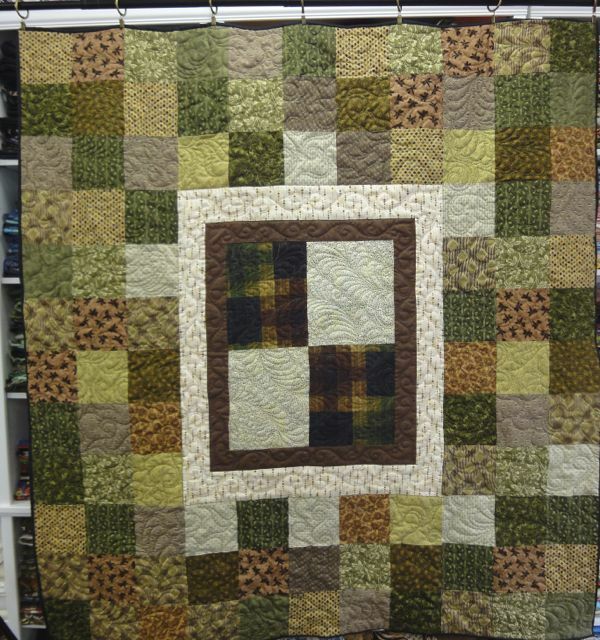 We began with the four patch in the center, then added a couple borders. 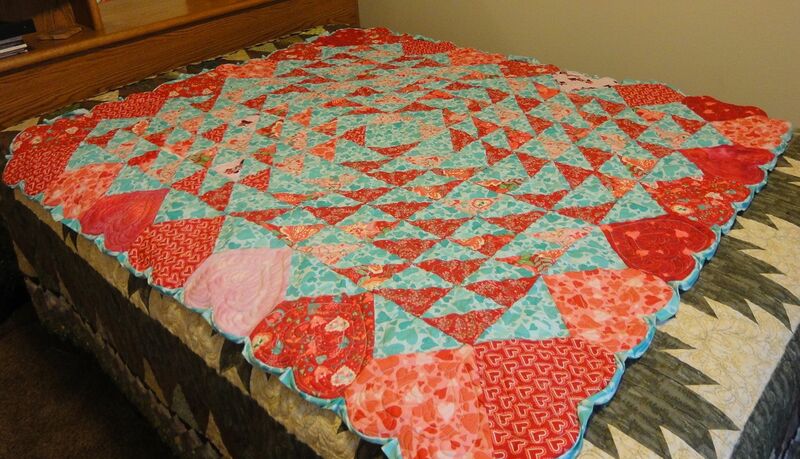 Then he found my Civil War reproduction fabrics and made a bunch of squares. He likes squares. 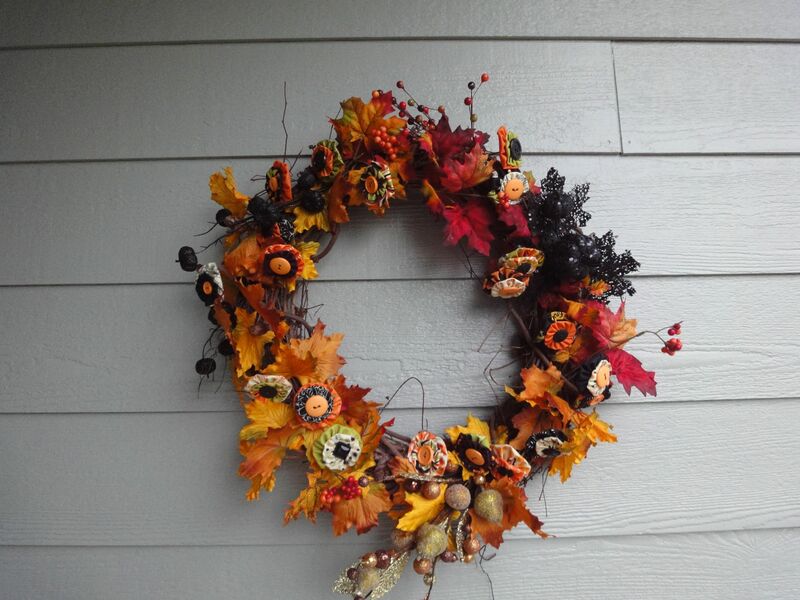 My husband and I lived in Elkton, Oregon for seven wonderful years, and we still miss our country life and the wonderful community there. 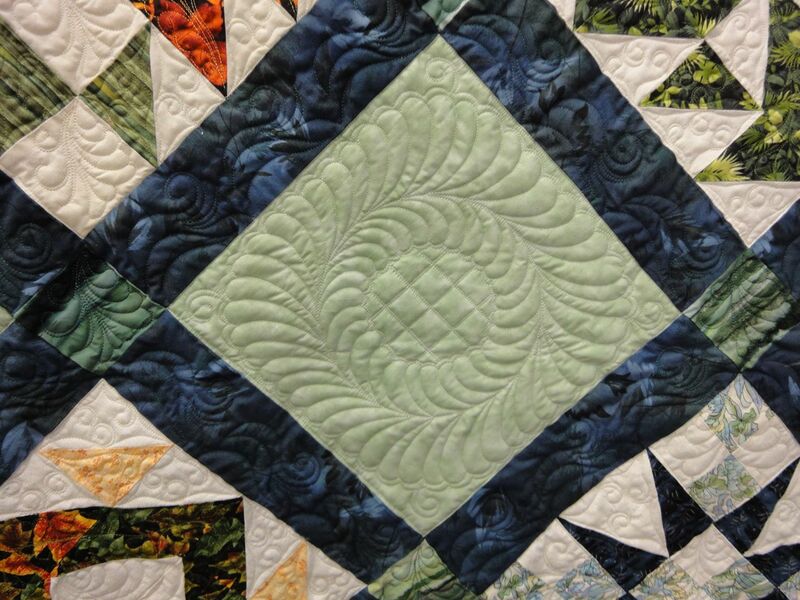 During those seven years, a quilting group was formed that meets at the Elkton Community and Education Center (a wonderful facility just west of town). 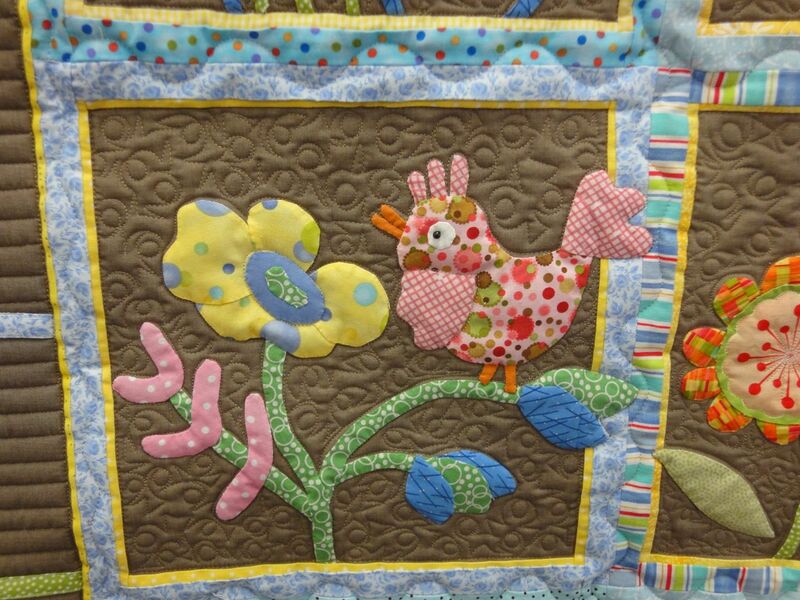 Elkton Quilters and Friends meets twice a month for a sew day, sharing information and techniques, hosting classes, and working on group projects. 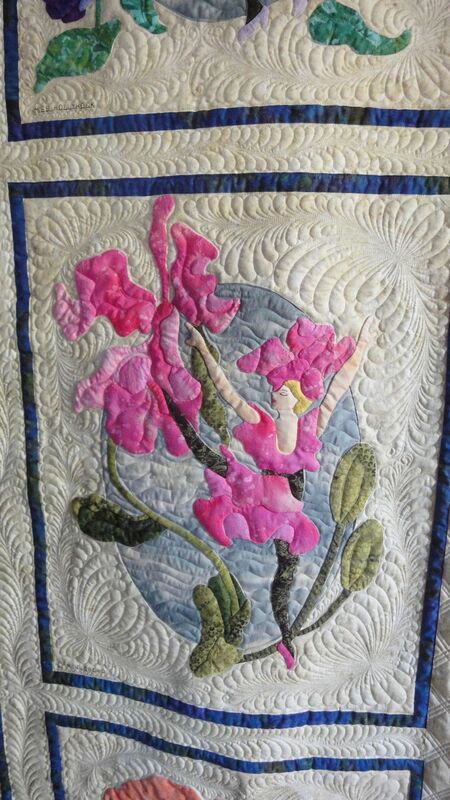 They recently asked me to quilt a sampler quilt the group had worked on, a wonderful appliqué pattern from Piece O’ Cake designs. 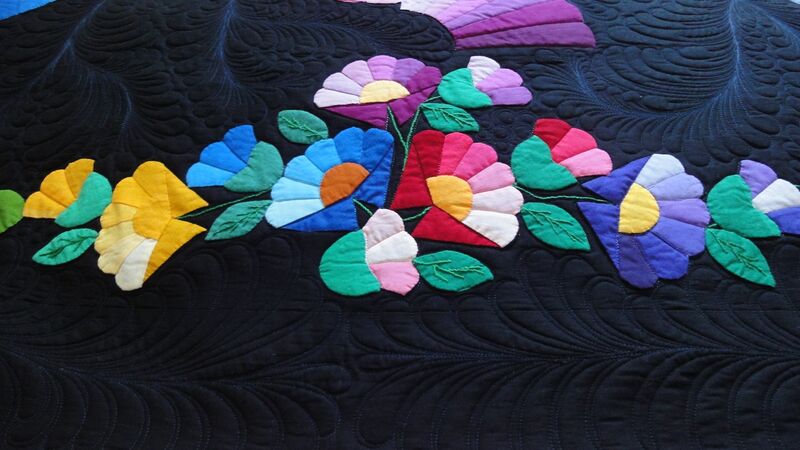 The beautiful applique is set off wonderfully with a darker background, giving the piece a modern look. 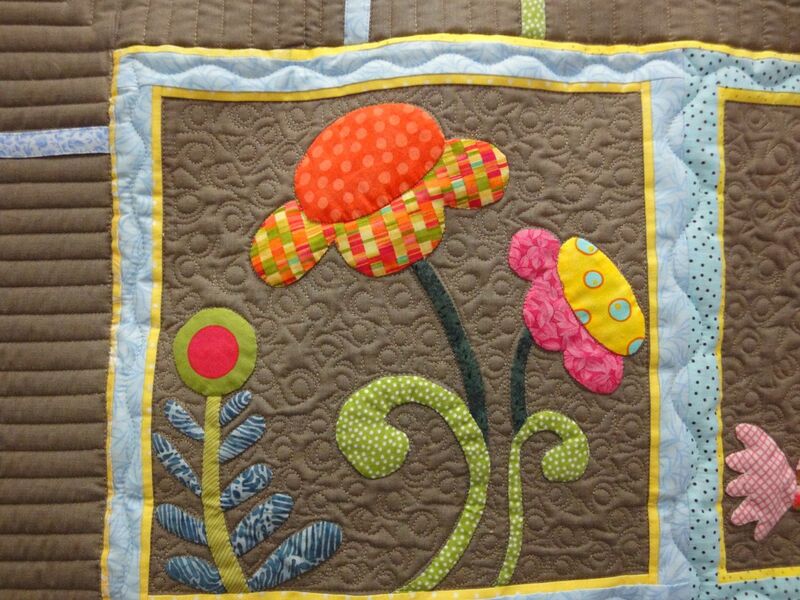 The first step in quilting this piece was to stabilize the blocks and the appliqué. Since it has a modern look, I knew I wanted to do something a little different in the background for fill. 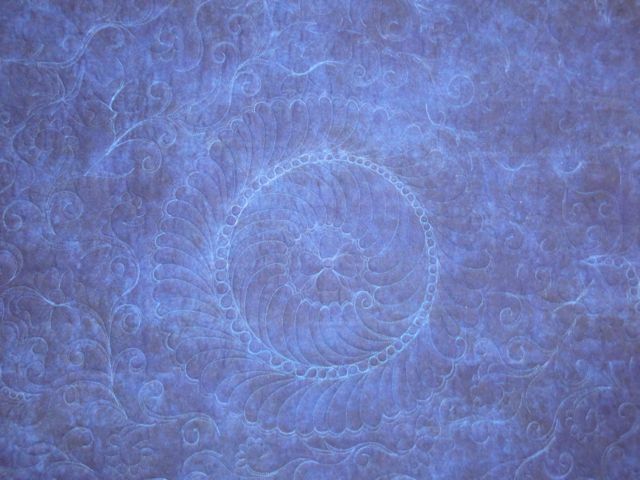 So I scratched around on some paper for a while and came up with this motif that I’m calling “Whing Ding Thingama-Jing” because that’s what I say when I’m doing the quilting! 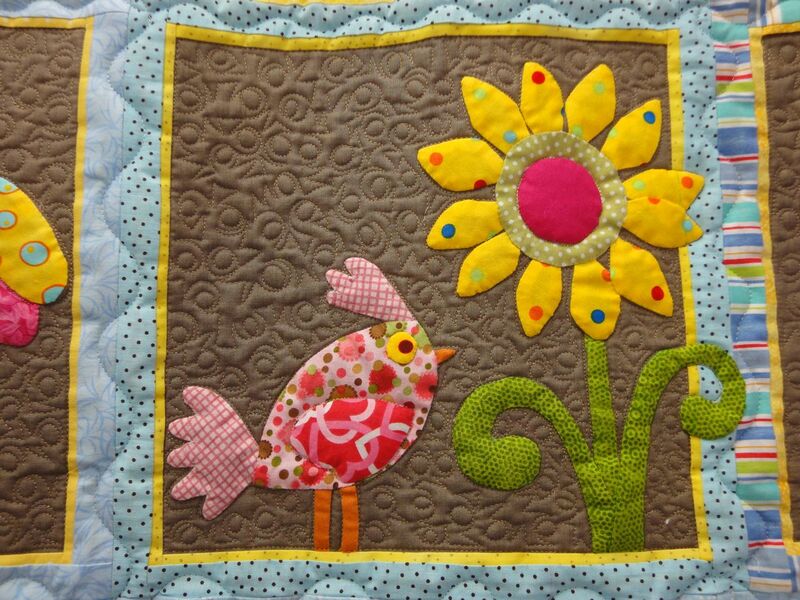 The applique blocks are wonderful! Head west on Highway 38 to reach Elkton. 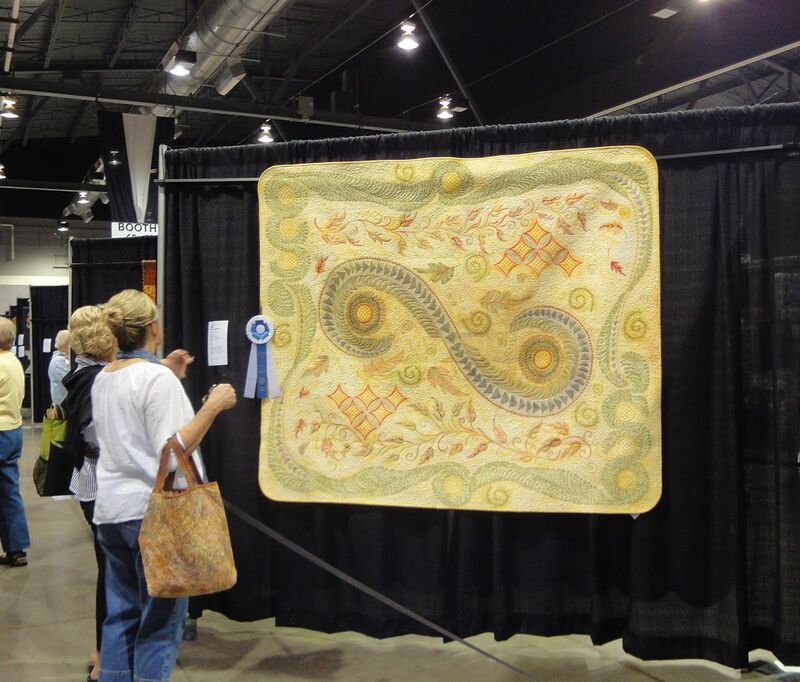 The community there sponsors events all year, and their community center and library features wonderful art shows. 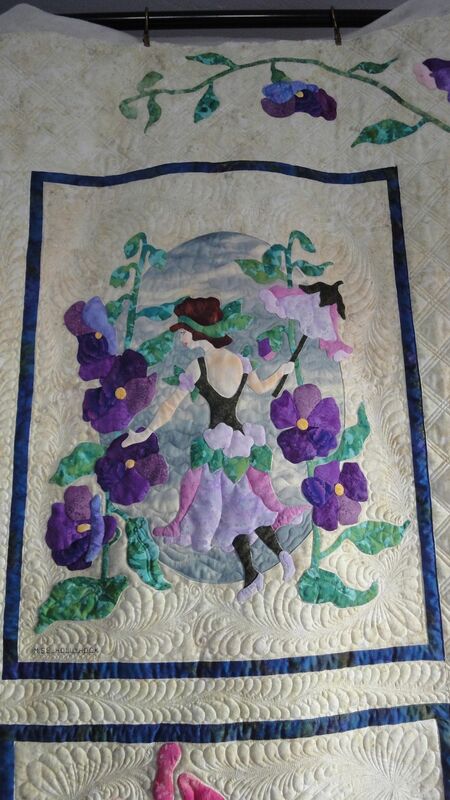 Perhaps you will see this wonderful quilt there! Autumn Pathways didn’t make it into the Road to California show. I was disappointed but my friends all consoled me and then I felt better. 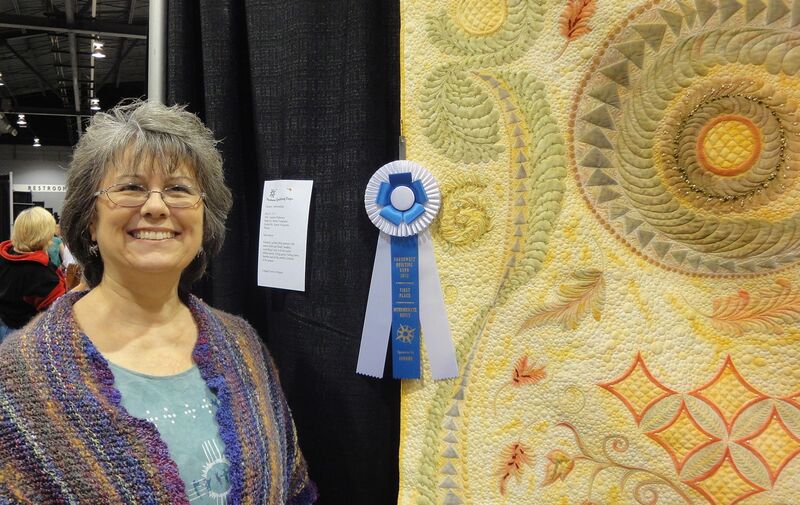 It was accepted to the AQS Lancaster show that opened today, and it received an HONORABLE MENTION! 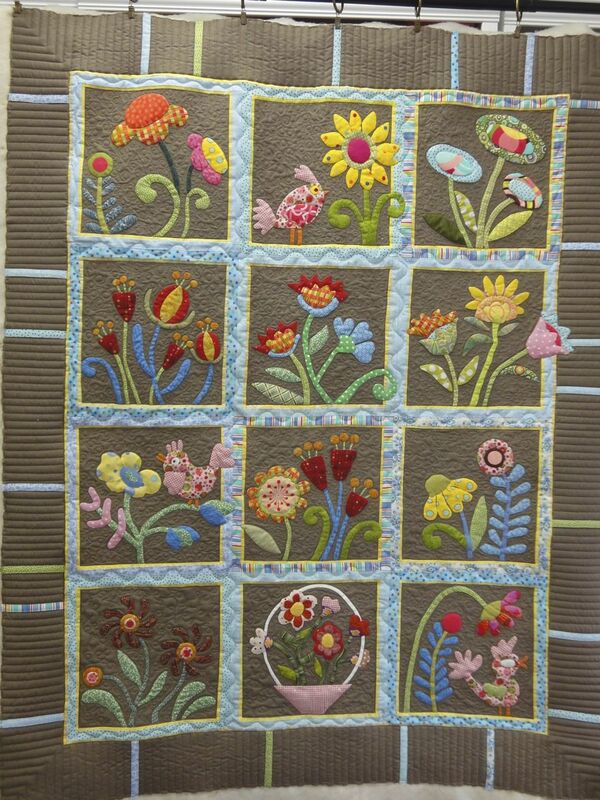 It is also accepted into the AQS Paducah show held this April. 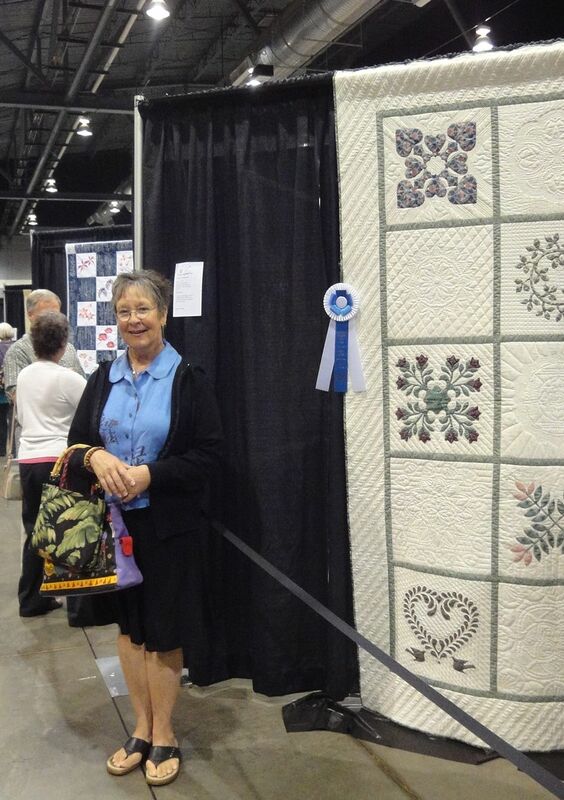 I have always lionized the Paducah show, and really did not expect to have the quilt accepted. I am thrilled!! 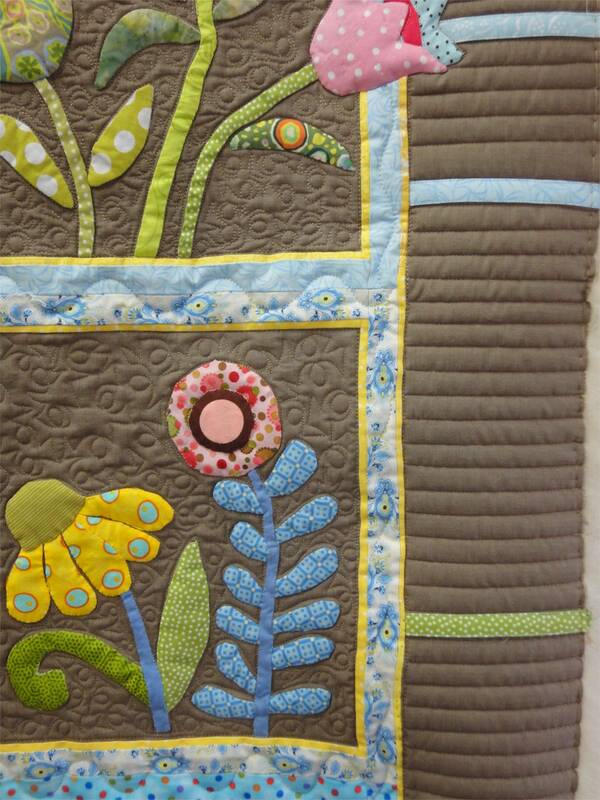 I can feel my biological clock ticking, and I want to give myself enough time to make a few more of these quilts. 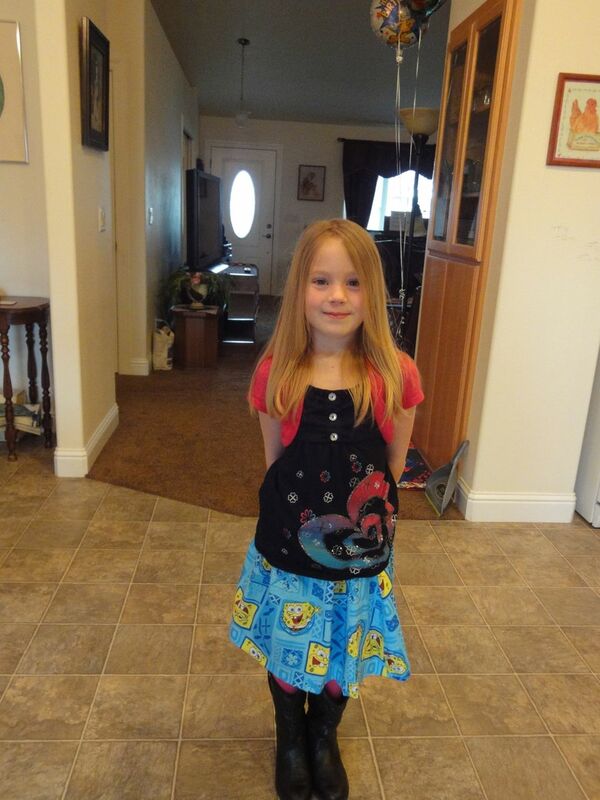 And of course, I also need enough time to make as many SpongeBobSquarePants skirts as possible! 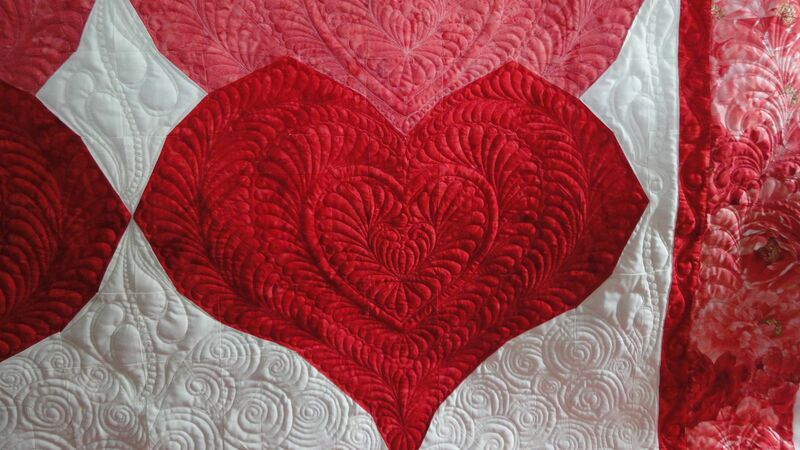 I have looked at the Storm at Sea pattern a number of times, and I did know you could create a heart shape by manipulating the color. 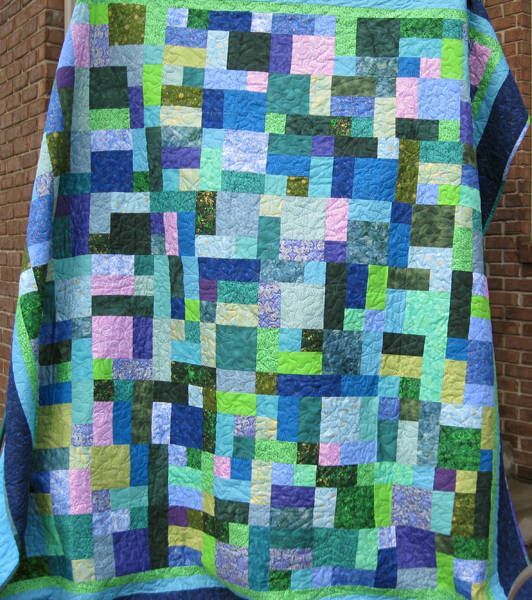 But this quilt came as a complete surprise to me when I realized what the pattern was. 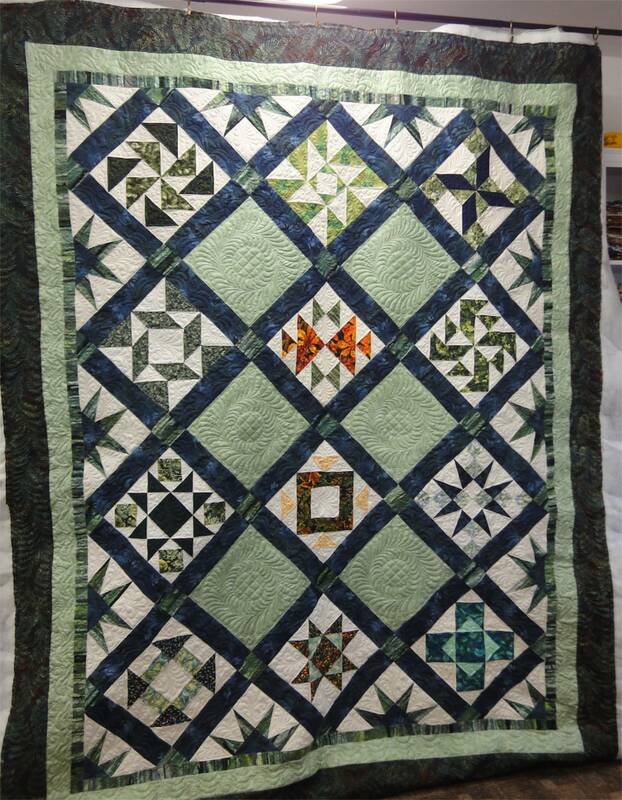 My client, Jan G brought this to me, with a couple other quilts, but this one definitely needed to be finished before Christmas. 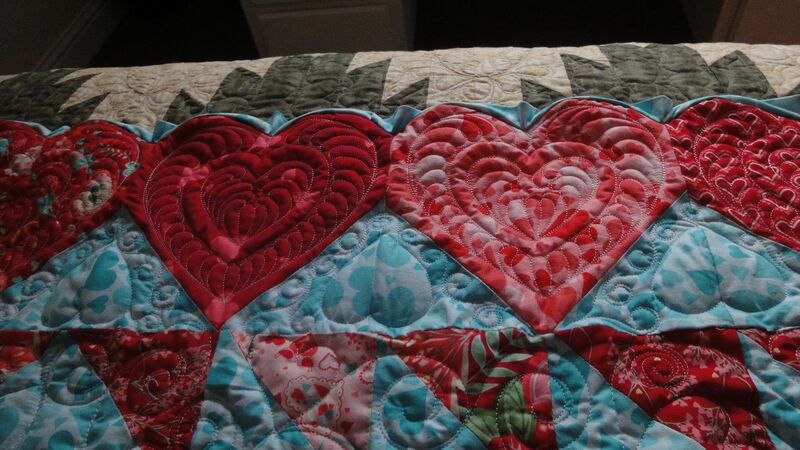 Hmm, hearts…what should I quilt on those? 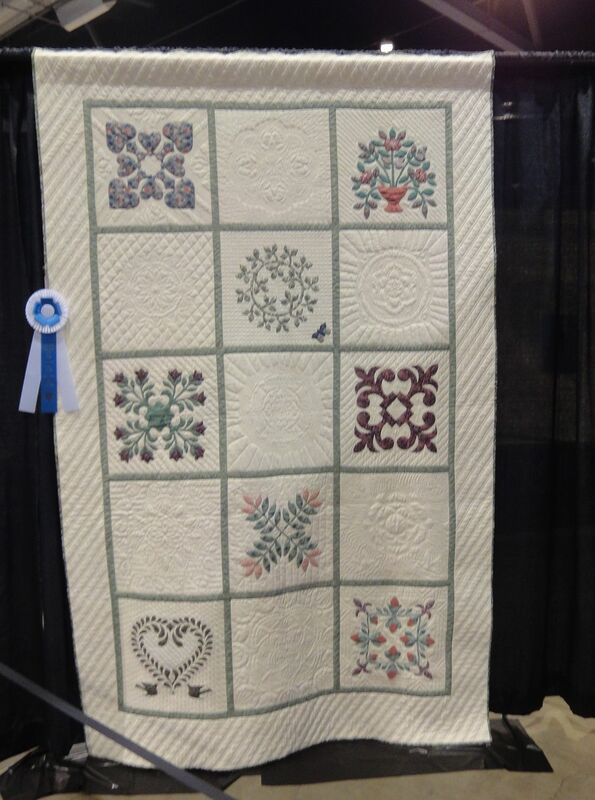 Isn’t this an intriguing quilt? Storm at Sea, who would have thought? 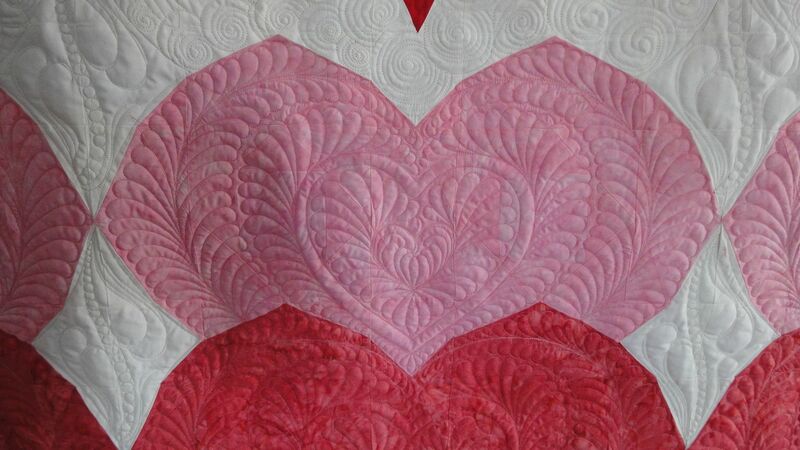 I quilted feather hearts inside the hearts, of course, using my entire set of heart templates to make the various sizes. 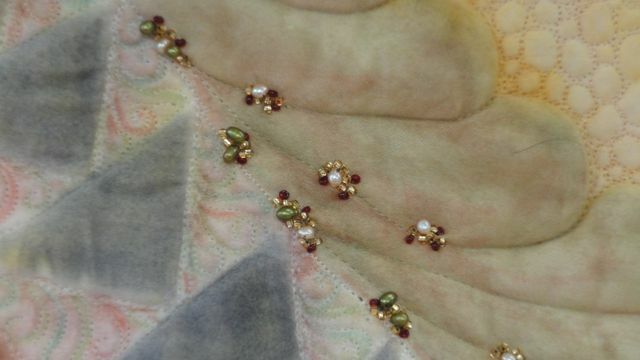 Inside the diamond shaped background is a curve filled with pearls and a couple of small feather-like flourishes. 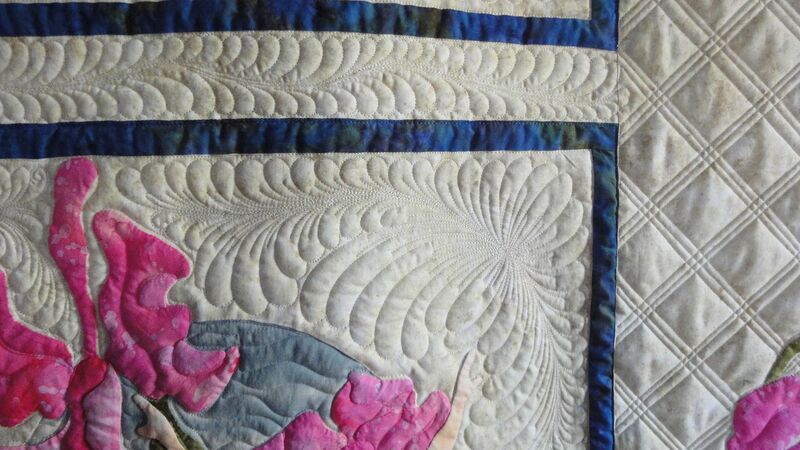 The fill is overlapping spirals. 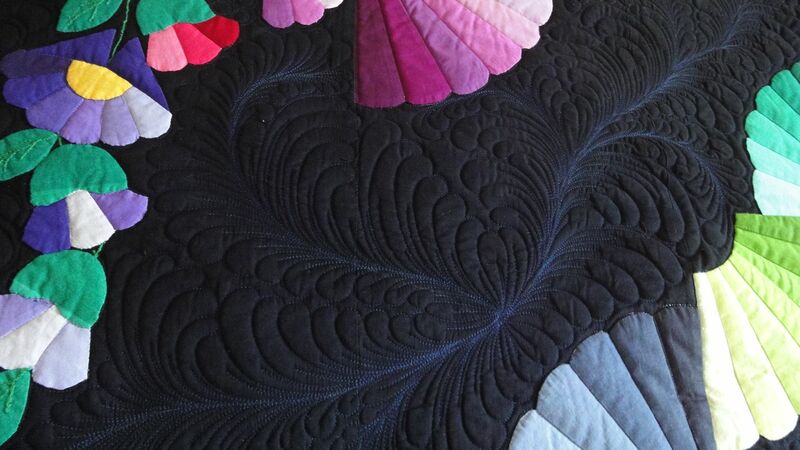 Then on the border is a pretty-much invisible undulating feather design. 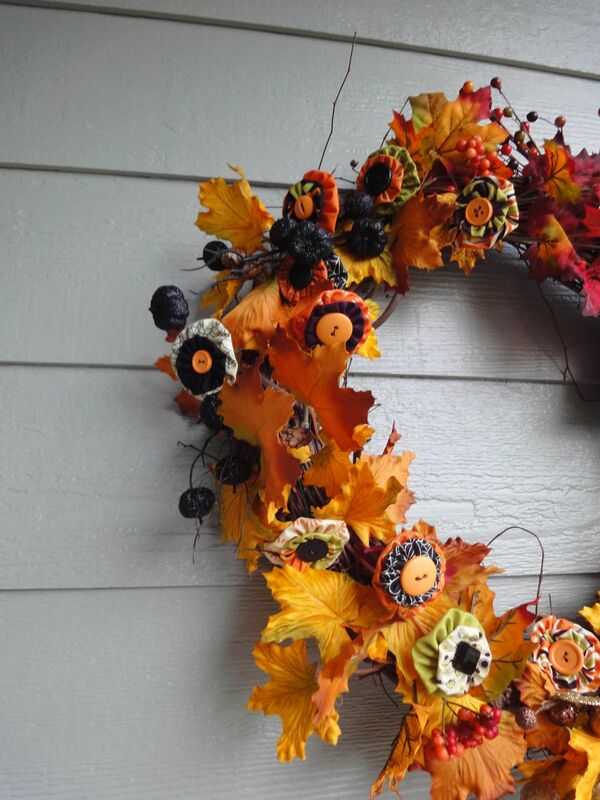 These are called “hook” feathers. 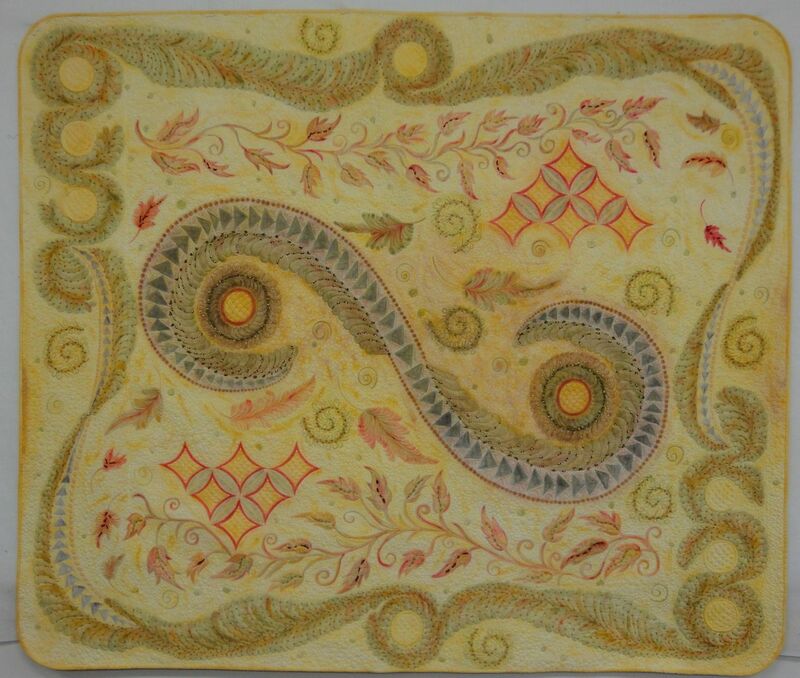 Each one is echoed individually as they are created. So this finishes my updates. 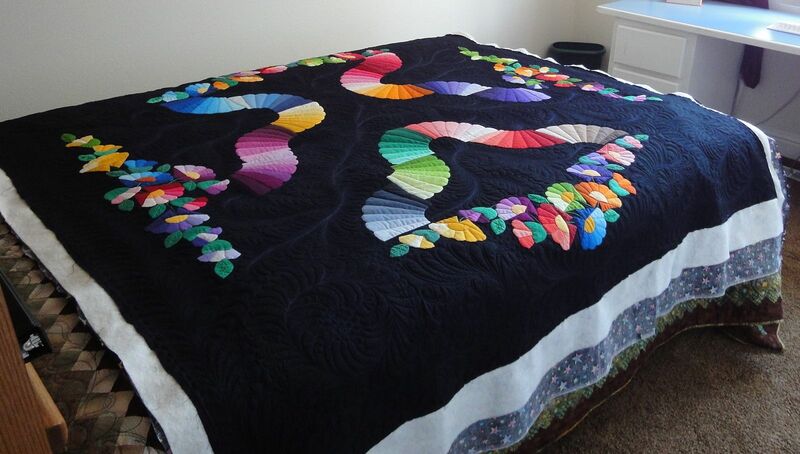 I am currently only one quilt behind, which means I’m on top of the world and have enough time to post these blogs!